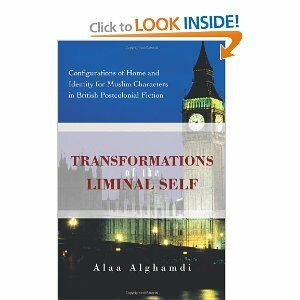 Today's book review is a book called "Transformations of the Liminal Self : Configurations of Home and Identity for Muslim Characters In British Post-colonial Fiction. The book is written by Alaa Alghamdi and it is a very informative read! I am going to be honest, this book is probably not something I would have picked up on my own, since I really didn't know much about the subject matter before beginning the book. But, I have to say that I am glad that I read and I did really end up learning a lot. The book's focus is on the complicated and sometimes confusing relationship between Muslim and Western culture for the people who have to live on both sides of the divide. I have never really imagined how difficult things must be for people who are born in one country but have family and history from another. The book focuses on British post-colonial literature to illustrate the points discussed, and I really found myself thinking a lot of about the lives of immigrants and what a difficult struggle it must be for them to really know the answer to the question: "Where Is Home?" The examples from literature that the book gave were spot on and really gave me a different perspective to think about. Alaa Alghamdi graduated in 2002 from King Abdulaziz University in Medina with a major in English and literature. He earned a master's degree in English literature from Newcastle University and recently earned his PhD in English literature from the University of Leeds, United Kingdom. Alghamdi is an assistant professor at Taibah University in Saudi Arabia.